This Chicago Acoustic Band is a blend of musicians from an assortment of backgrounds, strung together to form a band that explores the many sides of the acoustic genre. Using elements of vocals, guitar, banjo, fiddle, bouzouki, accordion, mandolin, and harmonica, they are a band that is able to find a niche in many acoustic laden songs. The group can range from a duo, trio, or more depending on the need of the client and available musicians. The band leader also performs many solo shows for a more reserved setting. Melding influences of traditional Irish, American country and bluegrass, and folk strains, this Chicago Acoustic Band creates a sound that has something for all followers of acoustic music. 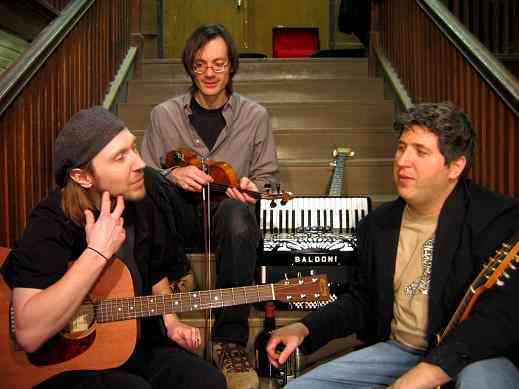 By using their multi-instrumentalist talents, they are able to perform heavy beat polkas to hills music, popular covers and classics, and driving modern acoustic rhythms to melodic and soaring spatial pieces. They have amassed an impressive resume of appearances at festivals, formal and corporate events, and opening slots for national acts. Their versatility is apparent as they seamlessly transition from club to pub to restaurant to party. With a bevy of both original and traditional songs in their repertoire, this Chicago Acoustic Band showcases musicianship that keeps fingers and toes tapping.